Ducks' Rich Hill Brilliant in Quick ALPB Stay; Return to Majors Next? 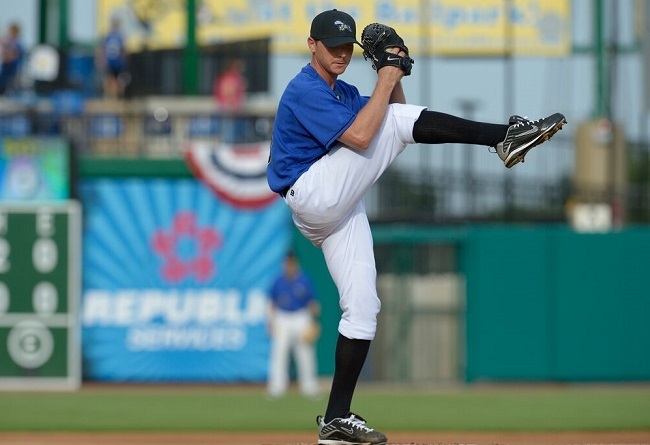 The Atlantic League virtually always draws attention when Scott Kazmir starts a game in the heat of the American League West divisional race, especially since he is now pitching for Houston which is only a few miles from Sugar Land where the lefty really started getting back on his way to returning to his major league form. It probably will not be for a pennant contender, but another left-hander may be the next product of the Atlantic League to return to major league stature. At least that seems to be a good guess with Rich Hill not only superb in two starts with the Long Island Ducks and also a shut-down hurler in his first outing after Boston acquired the 35-year-old's contract. It stands to reason the parent Red Sox would like to see Hill in person down the stretch since the 10-year major league vet, who has been used almost exclusively in relief in both the majors and minors in recent seasons, has been sterling in three consecutive starts. Hill had a five-inning no-hit effort the first time out for Long Island, then tied a franchise record with 14 strikeouts and six more scoreless innings (two hits) before the Red Sox signed him. He fanned 21 in all in the 11 innings he worked for the Ducks. The 6-foot-4 Boston native, who has lifetime 24-22 major league record, gave up only four hits in 6.1 scoreless innings against Lehigh Valley in his debut for Pawtucket and is scheduled to start at home against Philadelphia's top minor leaguers again on Friday. As for Scott Kazmir, he is drawing praise from various corners and leaves no doubt he is happy to be with Houston. "He kind of took (Oakland standout) Sonny (Gray) under his wing,'' Athletics Manager Bob Melvin told The Contra Costa (CA) Times recently. Gray currently leads the American League with a nifty 2.04 ERA.